Thought you might enjoy this sign from Mumbles Pier near Swansea, Wales. It's also near Catherine Zeta Jones' house. 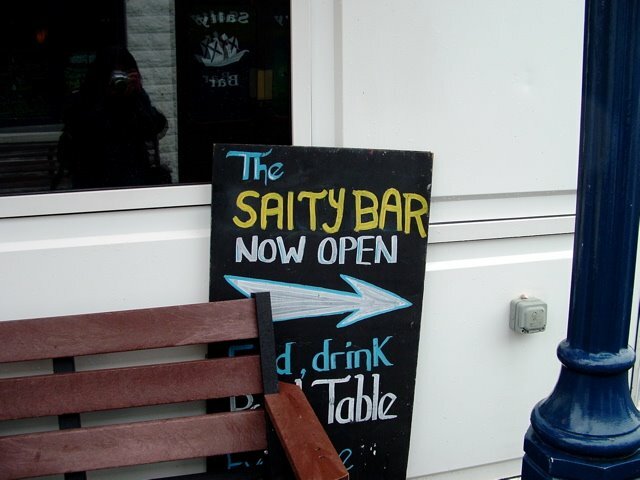 At first I thought it might have been a Welsh word, but I double checked with the friend I was with and there were also several SALTYs written on the bar itself. Swansea is also the home town of a former UK Big Brother contestant who was famous for saying "I like blinking, I do." No wonder they don't have much of an intellectual reputation. Is there method to the madness in this example? It looks like the author may have realized he was running out of space before he finished writing SAlTY BAR, which would also explain the hanging "R" at the end of the line. But placing an uppercase "L" close to an uppercase "T" with a bit of creative kerning would have done the job nicely, without all the lowercase L confusion. Well, Great Britain, now that we've got your attention, please continue to float your lowercase L's across the pond. Just Landed on your bLog and I have to say I like this topic, because twisted phenomenon like these bother me as well (like how many in the South drop the endings on words, like “the guest are coming”). Anyway, back to the subject. When I looked at this sign I read “Saity Bar” over a few times wondering what the hell that was (before I realized what your blog was about). I love the theme here and I’ll be on the lookout! Secondly, this is just a coincidence but I was born in Swansea! And you are right, I am not quite there inteLLectuaLLy. Just thought I'd add that in Welsh, not only is L a letter, but so is LL. I am told that it is correct to capitalise "LL" as one letter (e.g. the town LLanelli). Surely this increases the chances of more and more interesting lowercase L sightings there? I have decided to stay in Turkey for a little while longer, perhaps to find that elusive L. I found a perfect example at a festival but didn't have my camera on me. Sadly they decided to be efficient and empty/rotate the PlASTIC recycling bin. I was gutted when I couldn't find it again. Saity is a word, actually. It basically means "satisfaction." I'd want to go to a saity bar. That sounds good.